Who doesn't love Tombstone? It's one of the most beloved Westerns of the modern era. And if you're a fan, you can undoubtedly quote most, if not all, of the lines delivered with scene-stealing flair by Val Kilmer in what's become the definitive portrayal of gambling gunslinger Doc Holliday. You may know every scene in this movie like the back of your hand, but today we've collected 10 Things You Never Knew About Tombstone. And you may walk away pleasantly surprised and shocked. Tombstone boasts one of the most formidable macho ensembles imaginable: Kurt Russell, Sam Elliott, Bill Paxton, Powers Boothe, Michael Biehn, as well as smaller roles for Michael Rooker, Thomas Haden Church, Stephen Lang, Billy Zane, Jason Priestly, Billy Bob Thornton, and Terry O'Quinn. So let's get into it, shall we? Tombstone is missing a few Earps. The heroic ensemble at the center of Tombstone includes Wyatt Earp, played by Kurt Russell, and his brothers: Virgil, played with typical awesome gruffness by Sam Elliott and Morgan, played by the late Bill Paxton, in all of his boyish but badass glory. But there were actually nine siblings in total: sisters Martha, Virginia, and Adelia; half-brother Newton; eldest brother James, and youngest brother, Warren. James, a professional gambler, saloon keeper, and Union veteran like Wyatt and Virgil, was actually in Tombstone during the shootout at the O.K. Corral, but he was believed to be sitting at home eating lunch. Warren wasn't in town for the gunfight but was deputized by Wyatt, joining him, Doc Holliday, "Turkey Creek" Jack Johnson, and Sherman McMaster on the Earp Vendetta Ride after Morgan's murder. Kurt Russell was Tombstone's real director. The late Kevin Jarre had written the Oscar winning Civil War drama Glory and was set to make his directorial debut on Tombstone, from his own script. But his inexperience and religious adherence to what was probably an overly long shooting script caused him to fall behind early on, after wrapping only the film's Charlton Heston scenes. On the advice of Sylvester Stallone, who apparently worked on Rambo: First Blood Part II the same way, Kurt Russell hired director George Cosmatos to be his on-set "yes man" while more or less secretly directing Tombstone himself. He sacrificed hours of sleep and several pages of his own character's dialogue to make it all work, promising Cosmatos he wouldn't reveal their secret so long as the director was alive, thought he did speak with Entertainment Weekly about the situation a bit in 1993. But it wasn't until 2013, almost ten years after Cosmatos passed away, that Russell finally revealed all in a candid, in-depth, and fascinating interview with the esteemed and historically focused True West Magazine. Val Kilmer more or less backed up his co-stars version of events in a 2017 post, writing, in part, "I'll be clear. Kurt is solely responsible for Tombstone's success, no question." Wyatt Earp really waded into a creek to shoot Curly Bill. It's one of the movie's most cinematic moments: a super powered and supernatural feeling showdown where Wyatt Earp charges directly into Curly Bill's line of fire. Somehow, all of the shots fired by Bill miss the famous lawman, just before he empties his double-barreled shotgun into the dumbfounded leader of the Cowboys. One of the Cowboys, Johnny Barnes, survived the gunfight in real life, dying from his injuries a short while later in a nearby farmhouse. Before he passed, he related the story of Wyatt Earp's near miraculous feat, portrayed in the film exactly as he described. Willem Dafoe almost played Doc Holliday. It's crazy to imagine anyone other than Val Kilmer as Doc Holliday, but Willem Dafoe was reportedly the first choice for the role. It's even crazier to imagine that the lead role in a Martin Scorsese film would sour a studio on an actor, but apparently, the decision makers balked at hiring Dafoe because of the controversy surrounding The Last Temptation of Christ some five years earlier. If the same reports are to be believed, Mickey Rourke turned down the role of Johnny Ringo. Rourke did later star in Danny Trejo's direct-to-DVD horror Western, Dead in Tombstone. As Lucifer. Doc Holliday said 'You're a daisy if you do!' in real life. In fact, all of the lines spoken by the actors during the pivotal scene at the O.K. Corral are said to be historically accurate, based on different historical sources, like newspaper reports from Tombstone that chronicled the famous shootout. But did Doc ever say, "I'm your Huckleberry?" For that matter, did Val Kilmer even say it? This is a hotly debated topic online. According to True West, the phrase "I'm your Huckleberry" is attributed to Doc in the 1928 book Tombstone by Walter Noble Burns, which was based in part on interviews with old-timers from the area. True West and other sources also contend, "I'm your Huckleberry" is an old Southern phrase meaning, basically, "If you want a fight, I'm your man," or even more patronizingly, "If you want to dance, I'll dance with you." Doc Holliday was born in Georgia and Kilmer certainly gave him a Southern aristocrat's charms. Then there are those who say the line is actually "I'm your huckle bearer," arguing that a "huckle" was a word for the handles on a casket, making a "huckle bearer" a pallbearer. That would make the line, "I'm your huckle bearer" pretty sinister. But we've gone to the source material. We took a look at the screenplay, a fourth draft dated March 15, 1993, to be exact, and it most certainly says "Huckleberry." Doc Holliday's Fingerwalking trick is a Val Kilmer staple. The way Val Kilmer's Doc Holliday rolls a coin across his knuckles isn't just super cool; it's something of a signature move for the actor, going all the way back to the 80s. Eagle eyed viewers will be rewarded with the discovery of similar finger walking maneuvers throughout Kilmer's pre-Tombstone filmography. In Real Genius, it's a pair of quarters; in Top Gun, a pen. Val Kilmer was born on December 31, 1959. That same year, the late Adam West played gunslinger Doc Holliday in not one, not two, but three different episodes of three different TV Westerns: Colt .45, Sugarfoot, and Lawman. Beginning in 1966, West starred in the role that would come to define him, as Gotham City's Caped Crusader. 30 years later, Val Kilmer put on the cape and cowl for Batman Forever. How did Kilmer come to accept the mantle of the Bat, after Batman and Batman Returns star Michael Keaton abdicated from the role? Batman Forever director Joel Schumacher was impressed by Kilmer's performance in Tombstone, as Doc Holliday. Doc Holliday and Frederic Chopin have a very sad connection. Doc Holliday says so many cool things in Tombstone that even his more subtle witticisms made their way onto t-shirts, patches, and memes. The profanity laced line about Frederic Chopin, which Doc says to Billy Clanton (Thomas Haden Church), is loaded with a richer, if profoundly sad, deeper meaning. Both Doc and the composer whose music Doc plays are believed to have died from the same cause: Tuberculosis. This famous quote from Chopin is definitely something it's easy to imagine being uttered by Kilmer in Tombstone: "I wish I could throw off the thoughts which poison my happiness, but I take a kind of pleasure in indulging them." Frederic Chopin died in 1849, two years before Doc Holliday was born. Tombstone has plenty of Hollywood Western Easter eggs to discover. The filmmakers behind Tombstone paid attention to historical accuracy and even put Wyatt Earp's real life fifth cousin in the movie, in the role of Billy Claiborne. The nods to Hollywood Westerns were sewn into the Tombstone fabric with equal reverence. For starters, there's the film's narrator: screen legend Robert Mitchum. The Tombstone cast also includes veteran Western actors Harry Carey, Jr., Buck Taylor from TV's Gunsmoke, and of course, Charlton Heston. Paula Malcomson and the late Powers Boothe would both go on to star in HBO's critically acclaimed Western series, Deadwood. The super cool real-life Tombstone that made it's way into the movie. There's a headstone visible in an early scene with an epitaph so cool, it seems ripped straight from a plastic grave marker found in Halloween novelty shops. "Here lies Lester Moore, Four Slugs from a .44, No Les No more." But this isn't just movie magic. It's a real artifact from the Old West. There's actually a headstone in a Tombstone, Arizona cemetery that says that. However, that's not the one we actually see in the film. Producers actually filmed some of the movie on location at Knotts Berry Farm theme park in Southern California, where among other attractions, a replica of the headstone in question sits in the park's Wild West area. 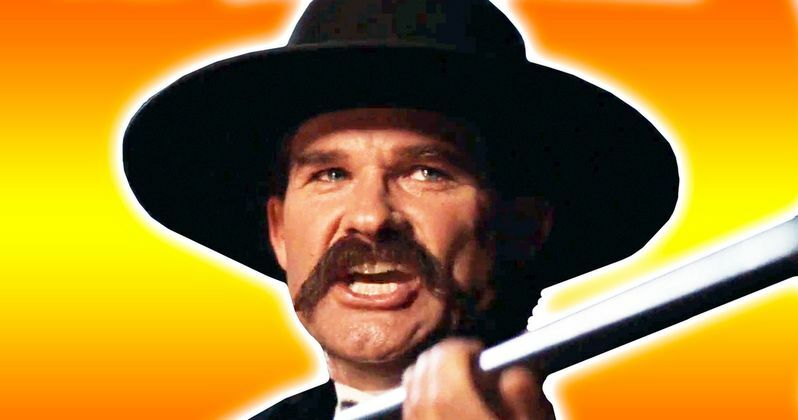 Somewhere, there's a bunch of footage in Kurt Russell's possession just waiting for an ultimate director's cut edition of Tombstone. But until then we will just keep quoting the version of Tombstone that we already have and we already so dearly love.